If you want to use your Android phone with AppRadio 2 be ready to spend an extra few dollars. AppRadio 2 is priced at $499 and doesn't include the required cables for connecting an Android phone. According to sources, the Android Connection Kit (CD-AH200C), which is made by Pioneer, will give you Android connectivity but will set you back an additional $100. The kit is not available for purchase yet. Pioneer has cited shipping delays for the unavailability. If you are looking to use AppRadio 2 with your iPhone 4 or 4S, you are good to go because no additional cables are required. But if you want Android connectivity you will need the kit. Are there alternatives? Well, according to one of our readers, 'Paco', you can get around having to buy the kit by purchasing a few third-party converter cables for much lower prices. 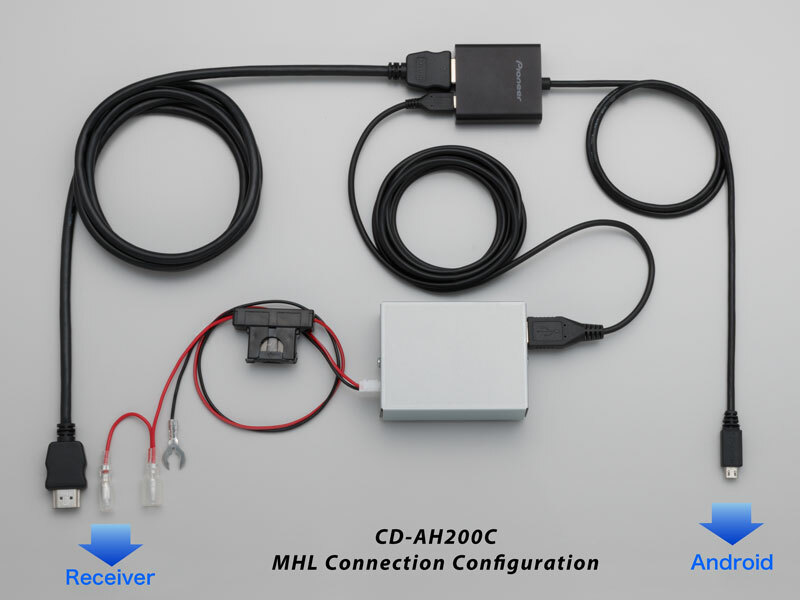 The MHL port promises industry-leading data connectivity so using an MHL to HDMI converter may compromise connection quality. You will also need a USB to micro-USB converter cable for powering your Android device (because most Android phones have micro-USB charging ports). Another interesting thing to look out for would be the ability to use phones not included in the list of compatible devices by Pioneer. Things will become more clear when the kit becomes available and more users start experimenting around with different phones and cables. I just bought a micro HDMI to HDMI a cigarette lighter adapter an MHL adapter a regular HDMI cable and a car charger for $24. This will connect my MHL phone as well as my brothers HDMI powered device for $24...they wanted $200 for that??? and mine is compact enough to fit behind a double din radio while Pioneer's is a huge converter box...what are they doing? -The unit was responsive and quick. -screen was bright and clear. -Can multi task. I ran Pandora and the map app at the same time. -drained about 10% of charge in my battery in about 30-45 mi of use. -I was not able to see what I was typing when using the map app. I was trying to search for a store nearby and it was not able to find it. When I searched for a zip code it was able to find it with no issues. -Unable to see traffic condition while using the map app. - Currently only 2 third party apps are available for Android (pandora and aupeo). One of the employee had an Iphone and it seem to work better. Many more apps were available. The map feature worked flawless without the issues I describe while using it on my android phone. But he could not use Pandora and the map at the same time. I dont know if it is due to the Iphone not able to multi task. Also both pictured and videos were not separated. I guess I was expecting too much for it to work with the Android OS perfectly. I hope purchasing the android connection kit would fix some of the cons but not for and extra $100. Pioneer should have included them if they were trying to target the android community. I already have the cigar lighter to charge. I have an several android phones with both mini hdmi and mhl. I could change connections easily if I place in a convenient location (not behind the radio). Under $25 dollars shipped. What a savings if it does. Just buy a micro or mini hdmi to hdmi cable. I bought one from amazon for $8 shipped. As for charging someone here said that if you connect a micro usb cable to the ipod cable that is included it will charge the phone. I have not verified this. I will try to go back to best buy and play with the unit more. Yes, that will charge the phone for you. I bought my Appradio2 from Crutchfield and they included this kit for FREE! So if you still are looking to purchase one, I would recommend that route.